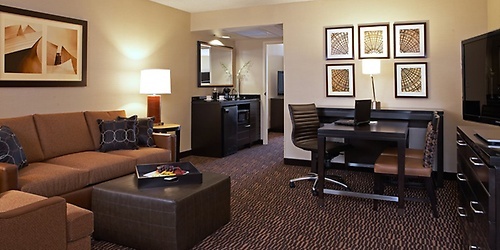 The Embassy Suites Los Angeles International Airport/North features spacious suites just one-half mile from LAX Airport and the Los Angeles coastline. Enjoy our complimentary cooked-to-order breakfast and complimentary evening Manager's Reception, while experiencing California cool in the warm, friendly ambiance of our hotel near LAX airport. 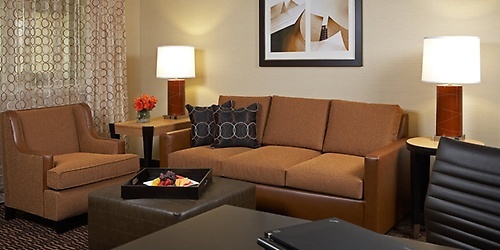 Here you'll find the perfect balance of comfort and functionality - with spacious two-room airport hotel suites, elegant décor, and thoughtful amenities. Don't feel like fighting L.A. traffic to find a room? Leave all the driving to us -- with our free 24-hour airport-shuttle service. Only moments from downtown Los Angeles, this preferred choice of LAX hotels will pamper you in a laid back setting.